That's what led to Thursday's roughly 12-hour strike at the Convention Center, which ended with a one-year extension of the customer-satisfaction agreement between the Pennsylvania Convention Center Authority and the city's unions, and a one-year extension of collective bargaining agreements. Under the settlement, the unions will receive a 2.5 percent pay increase for one year. The walkout unleashed bad publicity at a time when city convention and hotel officials are struggling to lure large groups to the center, which was expanded at a cost of $786 million in taxpayer money to do just that. It also came on the eve of a management company's taking over essential functions of the center, and as the Convention Center Authority board is negotiating new work rules with unions. At 9 a.m. Thursday, four of six unions represented at the center - the carpenters, stagehands, Teamsters, and riggers unions - set up a picket line over a contract proposal regarding exhibitor rights that the unions say "would further weaken the unions' jurisdictional rights and erode work hours for their members." A fifth union, the electricians, refused to cross the picket line. But the screwdriver-vs.-power tool issue, and all that it stands for, blew up three days of smooth negotiations between union and Convention Center officials about 10:30 p.m. Wednesday, say those involved in the talks. The current provisions, detailed in the customer-service agreement, let exhibitors set up booths as long as they are no larger than 300 square feet and as long as they do not use power tools. Most booths are 10 feet by 10 feet or 10 by 20. Management wanted to let exhibitors use power tools to assemble booths regardless of size. At stake was about half of their work, the unions say. The proposal would have taken "50 percent of our jobs in certain areas," said Michael Barnes, business manager of the International Alliance of Theatrical Stage Employees Local 8, the stagehands union. 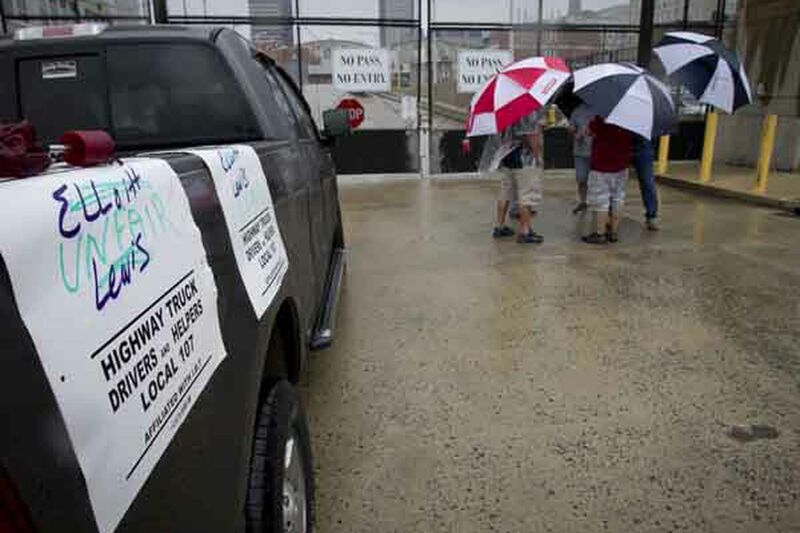 Pickets gathered outside the loading docks off Vine Street just as conventioneers of the American Association of Diabetes Educators, set to be here from Tuesday through Aug. 10, were setting up inside. The five-day gathering of 4,200 attendees is expected to generate more than 9,900 hotel-room nights with an economic impact of more than $14 million, tourism and hotel officials say. The strike came after a very public blowup in June 2012 among the Greater Philadelphia Hotel Association, the unions, and center management over who was to blame for the lack of business at the center. The hoteliers made public complaints by representatives of large convention groups stating why they were not returning. The complaints ranged from cost overruns to unfriendly service and even allegations of theft by union members. The unions denied the allegations. On June 5 of this year, after a long selection process, the PCC board selected the facility manager SMG of West Conshohocken to manage certain essential functions of the center "to make it more efficient and competitive" in a cutthroat industry, Board Chairman Gregory J. Fox said. "It is certainly unfortunate that a work stoppage occurred today just as a very large show was about to move into the center," Mayor Nutter said in a statement. Even the half-dozen unions were not in agreement on whether to strike. Ryan Boyer, business manager of the laborers district council, was opposed, and his union did not join the strike. Patrick Gillespie, who heads the city's Building Trades Council and participated in the negotiations, was also opposed. He voiced concern that Philadelphia's reputation as a union town drives up the cost of convening here. "The public-relations implications of this could have ramifications for years," Gillespie said in an interview. "We know how perception quickly becomes reality in this world." Jack Ferguson, president and CEO of the Philadelphia Convention and Visitors Bureau, which books the center, was hopeful. "In order for Philadelphia to remain competitive in a national and global marketplace, we must deliver the best experience at the best cost," he said. "We hope that our highly skilled union workforce will see that changes to the existing work rules will result in an increase in convention bookings." "I am very optimistic about the dialogue between the center, SMG, and the labor unions that emerged during these negotiations," Fox said in a statement at 11 p.m. Thursday. "I believe we all share the same goal of working cooperatively together to deliver our customers the best possible experience and make the center successful." Talks began in earnest Monday. By 9 p.m. Wednesday, most issues were resolved, including an economic package with raises wrapped in a 10-year contract for stability, people close to the talks said. Then power tools ended negotiations, creating a day of tension until a settlement was reached just after 9:30 p.m. Thursday. Contact Suzette Parmley at 215-854-2855, sparmley@phillynews.com, or on Twitter @SuzParmley. Contributing to this article were Inquirer staff writers Summer Ballentine, Troy Graham, and Angela Couloumbis.